Most homemakers will surely agree when I say that washing clothes and ironing are the most exhausting and back breaking house chores. Since I still do not have a house helper, I keep on finding ways on how to make my house chores light and easier, yet not compromising the cleanliness and quality of work done. I did mentioned in my previous post about Tornado Mop 360°:, my new cleaning buddy in mopping the floor. It really has helped me a lot, especially in cleaning the hard to reach areas. 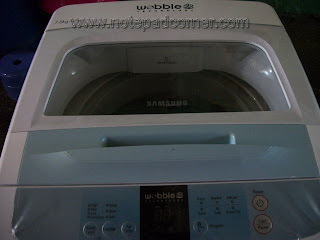 Lately, I saved hard to buy a Samsung 3D wobble technology washing machine to make my laundry less of a chore. As I am suffering from trigger finger (flexor tendinitis) squeezing and wringing out clothes from my conventional twin tub washing machine makes my fingers ache more. 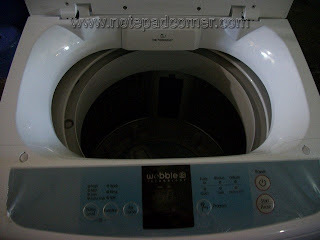 I searched for a new innovative washing machine that is affordable and dependable and I found out Samsung’s wobble technology is really a good buy. After using it for several washes now, I observed that it delivers cleanliness with no tangles nor knots and twists unlike in my old conventional washing machine where I need to struggle taking out tangled clothes, lol. I also can save great amount of water and reuse the rinse water as well for cleaning the garage and watering the plants. 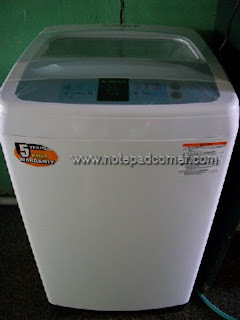 Its 3D Dynamic Wash feature increase washing power and save 40% of water to remove dirt. One more feature which I like in my new washing machine is its Air Turbo Drying System, very useful especially during the rainy days. The combination of air intake and turbo power make the clothes practically dry straight from the washer. Galing! ang nice nito marz talaga :) Pwede ba ko makilaba sa inyo? hehehe. over, the clothes are rinsed with fresh water and then dry it.